These GF Oat Bran Muffins are not too sweet and very satisfying. 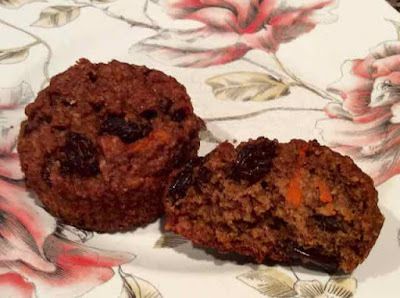 The texture is a little dense yet light and the muffins are moist, flavorful and delicious. I love raisins but you can use dried cranberries or chocolate chips if you prefer. I also added chopped nuts which gives the muffin some crunch. The carrots allow you to sneak some veggies into it. 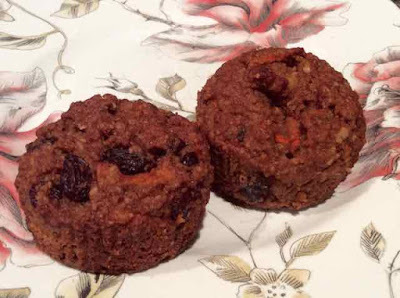 I made these muffins with my new secret ingredient for baking breads and cake like baked goods. By replacing some of the flour in a recipe with a tablespoon or two of coconut flour it make things fluffier and moister. I have also been experimenting with my tried and true recipes and it made my chocolate cupcakes even moister, lighter and more indistinguishable from a wheat cupcake. With this recipe I converted a wheat recipe into a gluten free one. I love the texture! For Dairy Free add 1 tsp, of apple cider vinegar to ¾ cup of non dairy milk of choice and let sit for 10 minutes before using. 1) Preheat the oven to 375℉. Prepare a muffin tin by lining it with paper liners. Set aside. 2) In a large bowl add all the flours, salt, cinnamon, baking powder, baking soda, xanthan gum and gf oat bran, mix until well combined. Set aside. 3) In a medium bowl add the eggs, buttermilk, oil and molasses, mix well. Set aside. 4) Add the wet ingredients to the dry ones and mix until just combined. 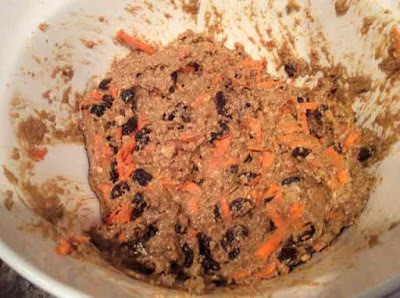 5) Add the grated carrots and nuts and mix in. 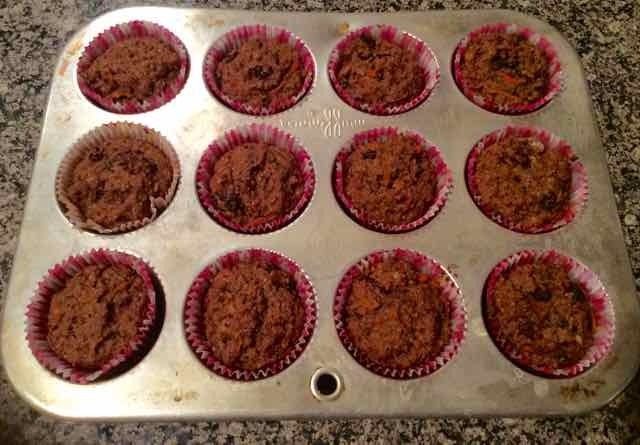 6) With a scoop that measures 2” across scoop out batter into the prepared muffin tin. 7) Place in oven and bake for 10 minutes at 375℉, then reduce the oven temperature to 350℉ and bake for another 15-20 minutes or until the muffins spring back when lightly pressed with a finger. 8) Cool in the pan for 5 minutes before removing from the tin to completely cool on a rack. Baked GF Oat Bran Muffins in liners in a pan. 9) You can freeze the muffins and then allow them to thaw at room temperature for 30 minutes before eating. You can also reheat the muffins before serving. GLUTEN FREE OAT BRAN MUFFINS WITH CARROTS AND RAISINS Makes about 24 muffins ¾ cup Sorghum Flour ¼ cup Tapioca Flour ¼ cup Chickpea Flour ¼ cup Coconut Flour 1 cup GF Oat Bran ¾ tsp. Xanthan Gum 1 ½ tsp. Cinnamon 1 ½ tsp. Baking Powder 1 tsp. Baking Soda ½ tsp. Himalayan Sea Salt 2 large Eggs ¾ cup Buttermilk For Dairy Free add 1 tsp, of apple cider vinegar to ¾ cup of non dairy milk of choice and let sit for 10 minutes before using. ½ cup Canola or Sunflower or other light tasting oil 2 Tbs. Blackstrap Molasses 1 ½ cups Carrots - peeled and grated 1 cup Raisins - soaked in very hot water for 10-15 min-utes and then drained (this keeps them moist even after baking) 1 cup Pecans or Walnuts - chopped INGREDIENTS DIRECTIONS 1) Preheat the oven to 375℉. Prepare a muffin tin by lining it with paper liners. Set aside. 2) In a large bowl add all the flours, salt, cinnamon, baking powder, baking soda, xanthan gum and gf oat bran, mix until well combined. Set aside. 3) In a medium bowl add the eggs, buttermilk, oil and molasses, mix well. Set aside. 4) Add the wet ingredients to the dry ones and mix until just combined. 5) Add the grated carrots and nuts and mix in. 6) With a scoop that measures 2” across scoop out batter into the prepared muffin tin. 7) Place in oven and bake for 10 minutes at 375℉, then reduce the oven temperature to 350℉ and bake for another 15-20 minutes or until the muffins spring back when lightly pressed with a finger. 8) Cool in the pan for 5 minutes before removing from the tin to completely cool on a rack. 9) You can freeze the muffins and then allow them to thaw at room temperature for 30 minutes before eating. You can also reheat the muffins before serving.